"Bang yourself in the head with that thing." if and when Ba'athists reclaimed power. the basis of his current trial. since I left that place," he said. "I don't value this life that much. Every human being has his time to go . . ."
"I am the commander in chief . . . I prefer [death] by firing squad . . ." adding that it was "the right way" to execute a military leader. "Of course I'm not guilty, but I know they want me dead." "Threatening me with death doesn't mean anything . . . I couldn't care less. The life of any one Iraqi is no less valuable than mine." 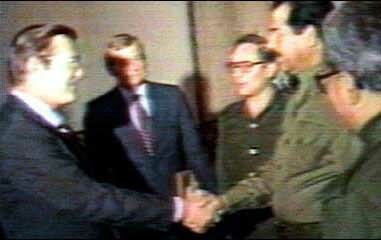 Saddam also praised the insurgency, saying it had prevented US attempts to "formulate a new world". "They tried in Iraq and failed badly, so by standing against Bush we are protecting other countries and regions of the world. Now the US will think a thousand times before daring to attack another country," he said. "The Iraqi people are patriotic; they cannot accept foreign rule. Any aggression will be resisted to the end. The Americans with their allies will fly out of Iraq very soon, and their puppets will leave even before the Americans," Saddam said.